Bryan Gallo of NBC Palm Springs interviews Chapter 13 Bankruptcy lawyer in Palm Springs Kevin Cortright about Chapter 13 Bankruptcy. Short on cash and cant keep up with the bills? There are options for you. Chapter 13 Bankruptcy is for somebody that has an average to high-end income range. These people don’t qualify for Chapter 7 Bankruptcy. Chapter 13 Bankruptcy does not eliminate debt as a Chapter 7 does, but instead helps to restructure it through the Bankruptcy court. If you are struggling with debt and can’t pay it back, but the courts still believe that you can pay some or all of it over time, they will work with you to create a solution. There are many benefits of filing Chapter 13 Bankruptcy. Immediate benefits include an automatic stay, which means that as soon as the bankruptcy is filed creditors have to stop calling and sending bills. It essentially means there is a stop but on the whole process while everything is figured out. More long term benefits include taking all of your bills and consolidating and restructuring them into one payment a month that goes to the bankruptcy trustee. This takes away all the stress of mail, phone calls, and dealing with separate entities, making it much easier to deal with the situation at hand. If you are behind on house payments and facing foreclosure you can stop the foreclosure instantly or restructure your debt. Debt is sometimes unavoidable, Some people might be out of work for a while, miss some payments, return to work and are then become behind on payments. Filing for a Chapter 13 Bankruptcy can even help restructure your past due mortgage over a 5 year period. This way, you won’t lose any property unless there is something that you decide you want to get rid of. 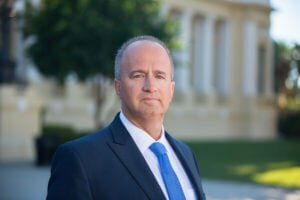 Kevin Cortright, Chapter 13 Bankruptcy lawyer in Palm Springs, can walk you through your situation. There are all types of debt that can be restructured, including taxes, credit cards, mortgages, car payments, etc. Restructuring also means that the interest rate is wiped out, and you are paying only the principal. If filing a Chapter 13 Bankruptcy is something that you might be considering, get more information here. When Do I File For Bankruptcy In Palm Springs? I would recommend Mr. Cortright to anyone and I have recommended him to friends and colleagues. If you’re ready for a free consultation to discuss your personal injury claim, workers compensation case, or bankruptcy matter in detail directly with Attorney Kevin Cortright, call the Murrieta Law Offices of Kevin Cortright at (951) 677-8064 or call our Palm Springs Law Office at (760) 325-6900. Or, fill out our online form to schedule your free consultation. The information contained herein is for information purposes only and should not be construed as legal advice. You should not act or fail to act based on the information on this website. The content contains general information only, and may not reflect recent changes to the law. All cases differ and results can vary depending on the specific facts of each case – please contact an attorney in your area to get legal advice as it pertains to your case. We are a debt relief agency helping people file for bankruptcy relief under the Bankruptcy Code. © Attorney at Law Kevin Cortright 2018. All rights reserved.